One of the first questions that many homeowners ask about their potential landscape design is “How much will it cost?” Budgeting and cost-estimating for landscape work is difficult as it can vary widely. One thing to keep in mind when looking at scope and budget is that your landscape should be considered an extension of your home. When designed well, your landscape will inspire you to spend as much time enjoying and using it as you do inside your home. Often people approach their landscape only as a tool to makes their house look nicer or to screen the view of the neighbors. While these are true of good design, the greatest benefit of a well-designed landscape is the increased living space that it provides and opportunities for experiences that can only be had outside. Grading 101: Make sure to match grades to adjacent features! Otherwise, quick fixes like this added asphalt become necessary and detract from the finished result. Poor planning and grading at stairs results in an awkward remedy. 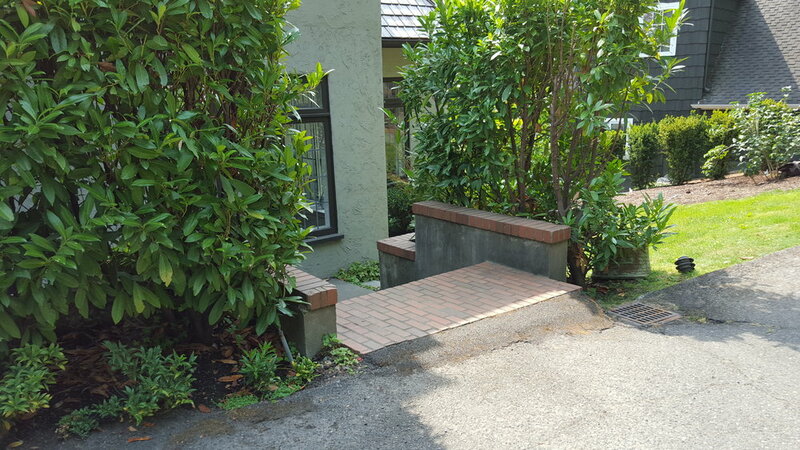 A good grading base makes blending materials like asphalt and stone beautiful and functional. Also, great curb detail where it steps down to meet grade at the stone band. First, keep in mind how quality and experience can create a wide range of prices in designers and contractors. It is possible to find “cheap” design services and labor but the end result may not always meet your expectations and can suffer in the longevity department (see pictures!) The ultimate value of using experienced designers and contractors cannot be understated. 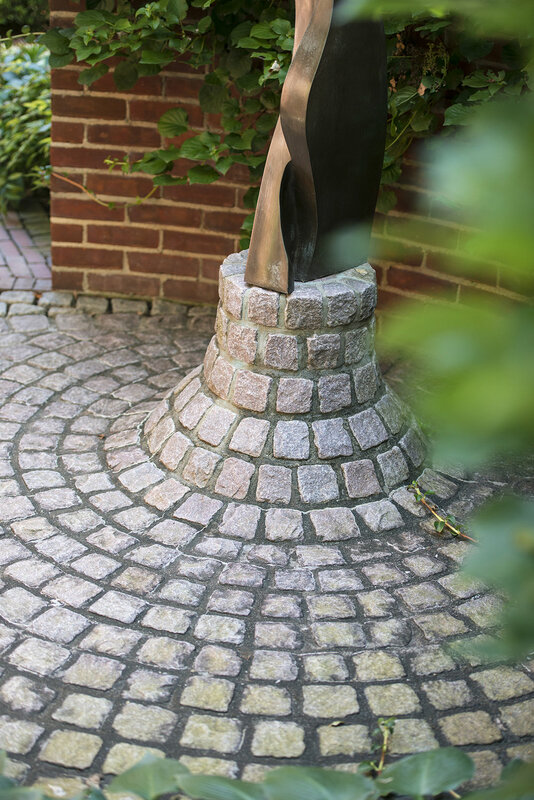 In addition to a plan that fits your needs, a good designer can help to specify materials and methods to use while building landscape components - helping to ensure against inferior materials and workmanship. A good contractor can help to rectify design conflicts and suggest alternatives - great news if you want things done in a timely fashion! Ideally, designers and contractors work in concert to create a finished project that maximizes your investment. Poor planning for a wall terminus. Great craftsmanship for a wall terminus - no gaps between wall and boulder! The second thing to take into consideration is how in-depth of a plan you actually need. Anything that requires permitting (such as building or remodeling a house) will require much more attention from designers and/or engineers. For a complete residential overhaul you might need to hire a team of architects, landscape architect, a structural engineer, and a civil engineer in order to get plans approved. However, it is possible to hire a designer to do a concept plan for your property at a much lower cost. This is a good option if you know or can find a highly-rated landscape contractor who has the experience necessary to translate a concept plan into construction. Just be ready for lots of questions! Concept plans contain much less detail than construction sets, requiring fewer hours to complete. Ask your designer for a proposal based on what is highest priority for you. It’s also an option to hire a designer on a “Time and Materials” basis where you pay them based on how many hours they work with a “Do Not Exceed” cost written in. Be open when discussing any cost concerns with your designer. It’s typical for clients to feel uncomfortable revealing how much they hope or intend to spend on a project; assuming that a designer may take advantage by maxing out that number. With a reputable designer or firm this is rarely the case. It is helpful for designers to know up-front what your budget looks like so they can tailor their plan to your budget. Poor planning and craftsmanship for paver edge on top. Care has been taken to trim each brick to fit. Some general guidelines for cost: design fees will typically fall around 10% of the total landscape project cost. This means that if your budget for landscape is $100,000 then design fees might amount to $10,000. While nearly impossible to assign a cost to landscape construction, know that it is almost always more than you anticipate (just like all construction!) Items like site walls, paving, re-grading, structures (arbors, trellises, etc.) can add considerable cost as they require skilled craftsmen to construct. Don’t despair at the first number that a contractor gives you as an estimate. There is almost always a “V.E.” (value engineering) phase to a project where cost saving measures are identified and discussed. Also, ask your designer about phasing the project so that you don’t have to cover the cost of everything at once. Of course knowing your “real” budget is difficult and often isn’t fully determined until after you hear bids from contractors based on your favorite design. Getting bids or cost estimates can happen even during a concept phase to help give you a rough number and know-how to proceed. It makes sense to cut loose a little during the concept phase and then scale back if necessary when numbers start coming in; so work with your designer to get all of your wants and needs included in the plan. Then, if the contractor bids shock you (they might), you can start the process of prioritizing what is most important to you and figuring out ways to cut cost without sacrificing too much. This will help you get to your “real” budget number: you might think in your head “this will probably cost $10,000” but then find contractors’ bids start at $50,000. After some prioritizing and cost-cutting you may find a happy medium at $20,000 with options to add features later.